Here is the cover of my newest book, which came out in November of 2016. The book includes step-by-step, visual guide to 149 embroidery stitches, motifs and extras. The book takes you beyond basic color theory– with robust color charts take the guesswork out of choosing thread, silk ribbon, buttons, beads, and trims. Then I show you how take your embroidery to the next level with luxurious seam treatments and stunning stand-alone designs! I include both traditional and contemporary techniques in the projects and gallery pieces that are showcased throughout the book. I have included a detailed project in the book which is called the “Embroidery Journal”. I think that every stitcher should have a log of stitches, one to refer to when working out an embroidered design. There are 12 sections of embroidery stitches, which are listed by category in the book. There are two examples of for each category, one at the beginning of the book in the table of contents, and then one in the section with the embroidery stitch techniques. Here is an example of the stitched samplers for the blanket stitch and variations and the chain and looped stitches. This 8-week class focuses on combining the stitches that were covered in the Embroidery Corner as border rows, decorative stitches and detail stitches. This is a no-sew project using cut fabric strips that are fused to a muslin square, some hand stitching may be required. The first week will be used to design and create the base. The following weeks will be used to embroider each strip with a border row, and then add in decorative and detail stitches using embroidery threads such as perle cotton and cotton floss. The finished project can be turned into a pillow or a wall hanging. My book Embroidered and Embellished is a required supply. Student must be familiar with both thread and bead embroidery stitches before class, as no stitches will be demonstrated. Student must also be familiar with and have some knowledge of beads and their sizes before class. Make a swatch chart, and assign color names and numbers to your fabrics. Learn to create a no-sew fabric base that does not require any machine sewing. Some hand sewing may be needed to finish the square. Create a color chart for components, using “Christen’s Color Theory” or your own. Begin the embroidery for the border rows. Continue to embroider border rows. Embroider decorative stitches with thread on, around and off the border rows. Embroider decorative stitches with beads. Student must be familiar with and have some knowledge of beads and their sizes before class. Embroidered small detail stitches both with threads and beads. Student must be familiar with and have some knowledge of beads and their sizes before class. The final touches will include embroidered and beaded buttons; stitched charms and more. Variety of bindings, stabilizers, and finishing touches. This class is not currently scheduled. The Crazy Corner, a master class by Christen Brown, takes the student from a pile of fabric to a finished CQ block in 16 weeks. In each 2 hour lesson you will learn comprehensive information that can be applied not only to crazy piecing, but in other aspects of your creative work. Due to amount of information covered in each class, the student is required to have the experience and expertise listed in the description under each week’s class listing. Hand embroidery and sewing skills are a must; some ribbonwork and bead embroidery knowledge is also helpful. 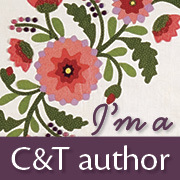 If you are new to embroidery may I suggest my book Embroidered and Embellished and my class The Embroidery Corner Series. Learn how to choose fabrics; combine textures and colors; and how to bring in additional colors with ribbon and lace. Explore the embroidery choices with thread, silk embroidery ribbon and beads. Identify and assign color names and numbers to your fabrics, trims, threads etc. Create a CQ base that does not require any machine sewing. Some hand-sewing may be needed, but for the most part the fabrics are adhered to a muslin base with a fusible web. Learn to dye laces, ribbon and threads using ColorHue dyes. I will bring the dyes for you to use during class time. *Please note: this class is a 3 hour class. Create baskets from lace, ribbon and embroidery stitches. Embroider a variety of spider web shapes. Student must be familiar with hand sewing skills, and these embroidery stitches: blanket, chain, coral, couched, fly, pistil, outline, stem and straight stitches. Create a vintage looking Dresden fan from ribbon and fabric; create a crazy pieced fan and fabric yo-yos; create a ribbon rosette. Student must be familiar with hand sewing skills. Create vines using the split stitch, couched stitch, chain stitch and a single crochet stitch (Christen’s own needle stitch). Student must be familiar with the first three embroidery stitches, and single chain crochet before class. Create a mini square from your leftover fabrics to audition color chart choices on (this will be used later as a pocket on the back of the CQ square. Then learn how to document progress using a diagram of CQ square, and graph paper. Then embroider border row stitches and their variations. Student must be familiar with embroidery stitches before class. Learn to create a woven, tatted or lace bird’s nest that can be filled with pearls or beads. Create ribbon baubles and buttons to stitch into vignettes. Student must be familiar with hand sewing skills. Create ribbonwork and silk embroidery ribbon flowers, ribbonwork and embroidered leaves. Student must be familiar with hand sewing skills, and be familiar with silk ribbon embroidery. Embroider lazy daisy, fly, chain, closed blanket and bullion stitch variations and designs. Student must be familiar with these embroidery stitches before class. Embroider beaded flowers, sequin flowers, beaded leaves and more. Students should have some knowledge of beads and their sizes before class. Embroidered French, Colonial and Chinese knots and straight embroidery stitches. Beaded centers and details will also be covered. Student must be familiar with the embroidery stitches before class and have some knowledge of beads and their sizes before class. Create butterflies, bees, spiders, lady bugs and snails with embroidery or ribbonwork techniques. Students must be familiar with the lazy daisy, fly, chain and French knot embroidery stitches, as well as ribbonwork techniques before class. Create tiny beaded extras that can be sewn into a vignette including beaded flowers, leaves, stars and more. Students should have some knowledge of beads and their sizes before class. Grouping, displaying, and sewing buttons, beads, charms and more. Bonus extra: learn to create a specialize charm or button using a photograph or special card. Lecture: Variety of bindings, stabilizers, and finishing touches. Student: Personalized suggestions, support and answers for each student. For a look at past students work, please see Crazy Corner: Students Work. These classes are listed with the price per visit. This class is not currently on the schedule. The above class fees reflect the content, the handout and any supplies noted in the description of each specific class. Once the fee of a class is paid for, you will receive a handout in an email, which will need to be printed and brought to class. This is an excellent beginning class to learn about beads, free-form stitched bead embroidery, with a step-by-step illustration of the design process. In Beadoodlery you will stitch beads onto to a fabric base to create a “doodled” bead pattern. I will provide 4 different heart shapes, though you can chose any design you like for the base. Class Requirements: Hand sewing skills, and some beading knowledge helpful. Date and time: This class is not currently scheduled. This class will teach you a little bit about the freedom of expression the “free form peyote stitch” can bring to your technical repertoire. The launching point of your bracelet and your creative explosion will start with a simple grosgrain ribbon, a small collection of buttons, a variety of seed beads in several sizes and colors combined with a few small treasures. Bring your imagination and creative spirit…. Lesson One: You will cut and prep the ribbon base; we will talk about setting up your beads; learn about focal placement and the stitching the buttons in place; then create your first tidal currents. Lesson Two: We will explore the basic peyote stitch; changing from between bead sizes within the current; making connections and creating more tidal currents; and adding in new thread. 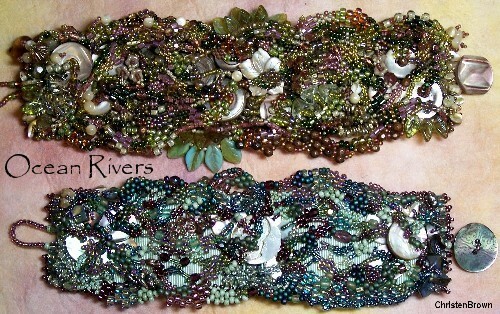 Lesson Three: We will cover creating waves along the outer reaches of the bracelet; stitching in the tidal pool treasures such as larger beads, sequins and chips with single bead stoppers, cascades and picots. Lesson Four: Finishing touches: stitching the button and closure loop; stitching the beaded shell edging; and barnacle extras. These classes can be purchased at any time, there is no set schedule. The class can be ordered by contacting Christen: thestoreonthecorner@gmail.com. She will send you an invoice through PayPal. 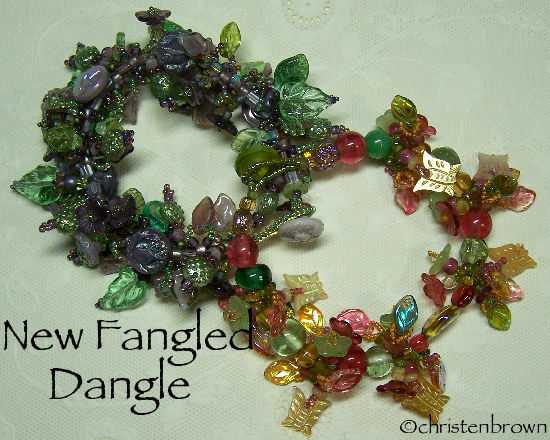 This is a wonderful project for those who want to create their own beaded jewelry. This bracelet reminds me of the charm bracelet my Grandmother gave me for my 10th birthday. The base row of large beads can also include buttons and then is adorned with charms and additional beads. All of the beads can be different, similar or even the same, and it will still look beautiful. This is the perfect piece of jewelry for any wardrobe, or to give as a gift for that special friend. Skill Level Beginner/Intermediate: beading knowledge will be helpful. Lesson 1: In this lesson I will show you how to organize your beads, and give you color and size options for the base and dangle designs. Then you will design the base of the bracelet, adding in the button and loop closure. You can choose to use all beads, or add in some buttons for flare. I will give several design options to choose from, but you may come up with your own depending on your components. Lesson 2: In this lesson the dangles and the beaded flourishes will be added to the base of the bracelet. There are so many different design options to choose from that you will want to make more than one, I am sure!